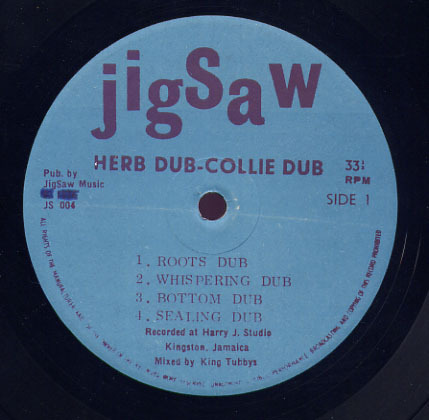 So here’s one for the hungover… Recorded by the Skatalites in 1975, the album Herb Dub-Collie Dub is often mistaken for a King Tubby work; however this was only ever partially correct. Spawning dub remixes from an earlier work – The Legendary Skatalites – Herb Dub-Collie Dub was recorded by Skatalites double-bassist and occasional percussionist, Lloyd Brevett at The Black Ark, before being mixed at Herman Chin-Loy’s Aquarius Studios. Alongside Brevett, Tubby produced the original album, but would lessen his involvement in the remixing stage, choosing instead to work on only three songs of the eight songs. In conjunction with Tubby, Lee ‘Scratch’ Perry overdubbed those three pieces tracks for remixing toward the end of 1975. A limited edition release, some pressings over the years have posted incorrect track listings, leading to general confusion, topped up with a dollop of intellectual meandering. The song presented here, “Whispering Dub” – a remix of “Candle Light” – was recorded and mixed by Brevett and while not exactly a stand out of the period, does represent a fairly solid interpretation of dub in mid-70s. Absolutely. It’s lush the way the brass just swoons downward in such a slick, lairy manner, almost as if in response to the lead horn.